This entry was posted on November 1, 2013 by Goplasticpallets. Pallet hygiene has been the topic of much debate in recent years after a number of pharmaceutical manufacturers were forced to recall products as a result of contamination issues, thought to have been caused by the wooden pallets the goods were transported on. Jim Hardisty, Managing Director of Goplasticpallets.com, examines this debate and explains how a new generation of plastic pallet boxes are helping pharmaceutical companies improve hygiene standards early on in the supply chain. It goes without saying that pallets have long been a staple product in the pharmaceutical supply chain. Manufacturers rely on them to transport raw materials and packaging components from the supplier to the production facility, and from there, deliver the packaged goods to the distribution centre ready for shipment to wholesalers and direct to pharmacies. Although the role of pallets today remains unchanged, the requirements of them are far more demanding than they have ever been. 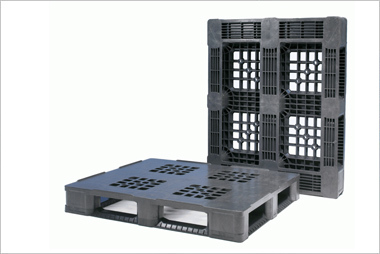 A greater variety of applications and uses has increased the demand for pallets to be made from different materials and in different sizes and styles. Lightweight models for easy shipping or strong and durable varieties for repeated use are just a couple of examples. In the pharmaceutical industry, the specific need for pallets to be used in sterile environments has led to other innovations. A large number of drugs companies still use wooden pallets. Some remain loyal to the humble wooden pallet through tradition, others due to the cost of switching to an alternative. However, a series of incidents where pharmaceutical manufacturers were forced to recall contaminated products has put a big question mark over the safety of using wooden pallets in the pharmaceutical supply chain. According to the US Food and Drug Administration (FDA) website1, wood pallets were first identified as a likely cause of product contamination in January 2010, when Johnson & Johnson recalled certain lots of over-the-counter (OTC) drugs, including all Tylenol Arthritis Pain Caplet 100 count bottles in the USA, UAE and Fiji, and a further 26 product lots of OTC tablets, including Benadryl and Motrin, in June and July the same year. The recalls stem from an investigation of consumer reports of an unusual mouldy odour which caused gastrointestinal illness including nausea, vomiting and diarrhoea. Also in June 2010, speciality pharmaceutical company Depomed recalled 52 lots of its diabetes drug Glumetza following similar customer complaints.2 Pfizer then became the third drug company to follow suit when it recalled a total of 360,000 bottles of its cholesterol-lowering drug Lipitor in August, October and December.3 Subsequent recalls by Johnson & Johnson, including three incidents in 2011, are thought to have cost the company approximately $900 million in one year alone. According to scientific tests, the cause of contamination was a chemical called ‘2,4,6-tribromoanisole’ or TBA, which is caused by the breakdown of another chemical, ‘tribromophenol’ or TBP, which is used in some countries by wooden pallet manufacturers both as a wood preservative and flame retardant. Insufficiently dried wooden pallets exposed to high levels of humidity are susceptible to fungal growth which can result in the biomethylation of TBP to TBA. To avoid fungal growth, the moisture content in wooden pallets must not exceed 13 per cent; otherwise they become the perfect breeding ground for potentially harmful bacteria. Storing wooden pallets outside in wet or humid conditions and poor ventilation in warehouses can both contribute to fungal growth. TBA is a highly volatile chemical and is most commonly detected by a mouldy, musty odour. Traces of TBA were found on the product packaging in each of the recall incidents highlighted, suggesting that the wooden pallets the products were transported and stored on were to blame for the contamination. The National Wooden Pallet and Container Association (NWPCA) maintains that wooden pallets are a safe method for transporting pharmaceutical goods, but these recent incidents suggest otherwise. Although the hype surrounding these contamination incidents has died down, it has led to greater scrutiny in the use of wooden pallets in the pharmaceutical industry. Pharmaceutical manufacturers take great care packaging products to ensure product safety and avoid external influence. 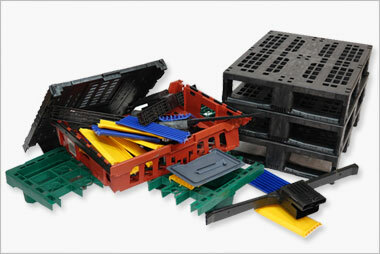 However, it appears that less importance is given to choosing the type of pallets the products are distributed on. When selecting which type of pallet to use, there are a number of factors that should be considered and prioritised: material; size; load capacity; strength; handling; application; and frequency of use. Offering drug manufacturers clearer guidance on the distribution of medicinal products, in particular on the selection and use of pallets and pallet boxes, will allow them to make an informed decision and could prevent future product recalls associated with pallet-related contamination. The invention of the pallet is a relatively recent innovation, made in the shipping industry, the first one appearing in the United States in the early 20th century. The earliest referenced patent is Howard T. Hallowell’s 1924 ‘Lift Truck Platform’, a simple skid that consisted only of stringers fastened to a top deck. During World War II, the development of the pallet really took off with the increasing need to ship goods and arms. Palletised loads could handle more goods with fewer people, freeing up men for military service. The introduction of the wooden pallet spelled a new era for the shipping industry and it wasn’t long before a standard pallet size was adopted. Today in Europe, there are approximately half a billion pallets in circulation every year, with 70 million of those in circulation in the UK. The wooden pallet remains dominant, accounting for about 90 per cent of these pallets. Plastic pallets currently make up the other 10 per cent, but with the threat of wooden pallet contamination, plastic pallets and pallet boxes could become the saviour of the pharmaceutical supply chain. My advice to drug companies is simple – put hygiene first and go plastic. I don’t mean just using plastic pallets in the pharmaceutical production areas, where the tiniest traces of dust and dirt on wooden pallets can contaminate medication. I mean introducing plastic pallets right at the start of the supply chain. It is believed that the UK pharmaceutical industry alone spends over £13milion per day on R&D; such is the drive for innovation and the launch of new products in the sector. Improvements in packaging are resulting in better plastic containers, greater barrier protection, greater security and ease of use. Our GoBox Hygienic pallet box is a prime example of a new product that is improving hygiene standards in the pharmaceutical supply chain. 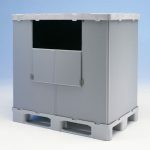 Made up from three plastic components – a Hygienic pallet base, a fully sealed 5mm sleeve centre, and a secure fitting lid – the Hygienic pallet box is ideal for use right at the start of the pharmaceutical supply chain, for transporting all types of packaging components from the supplier to the production facility (bottle tops, foil trays, rubber closures, aluminium caps plastic bags etc.). Rival products have failed to achieve the same hygiene standards as the Hygienic pallet box, due to its smooth lines and easily cleaned components. The Hygienic pallet base is manufactured from 100% pure virgin plastic and complies with EU safety legislation. Both the pallet and sleeve have totally smooth, sealed surfaces which can be easily cleaned, but do not absorb moisture – even under the most adverse conditions. 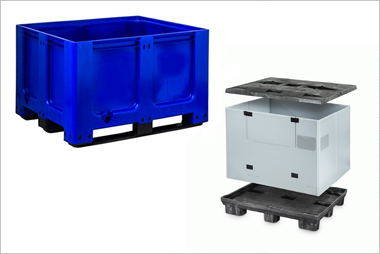 The simple, lightweight construction of the Hygienic pallet box means it can be assembled in minutes and a durable clip system ensures the sleeve remains securely in place. A single drop down door facilitates the packing and unpacking of packaging components, but also seals closed with Velcro to keep contents secure during transportation. It is also compatible with plastic dividers, so packaging components can be stacked safely inside. Exceptional environmental credentials also make the Hygienic pallet box an attractive proposition to pharmaceutical manufacturers. Firstly it removes the need for packaging components to be pre-packaged, wrapped or bagged for transportation – removing up to five layers of additional packaging. Secondly, the Hygienic pallet box folds flat when empty, so it can be stacked 10-high in collapsed mode, saving space and fuel on return journey transportation back to the supplier for repeated used. 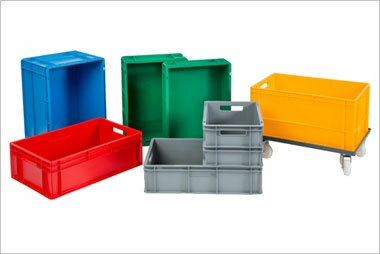 In addition, all three components that make up the Hygienic pallet box are recyclable, so at the end of their working life the plastic can be reground to produce other plastic products. The Hygienic pallet box is available in two footprints 1200mm x 800mm and 1200mm x 1000mm and two standard sleeve heights 780mm x 1040mm. 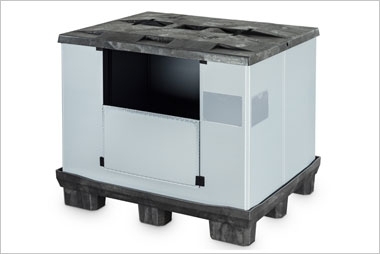 The smaller footprint provides an internal capacity of up to 950 litres and the larger footprint up to 1050 litres, and each pallet box is able to carry a maximum load of 800kg, or 1600kg when stacked. Product contamination issues caused by certain types of pallets could be prevented by offering pharmaceutical manufacturers clearer guidance on the selection and use of pallets for transporting all types of packaging components and medicines. To achieve this, however, manufacturers must be prepared to re-evaluate the use of pallets throughout their entire supply chain and put hygiene at the top of their agenda.